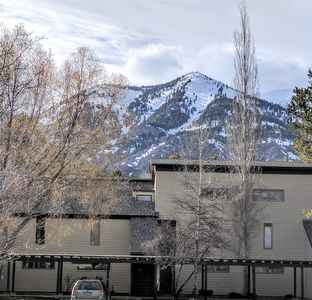 If you want both privacy and convenience, Summer Wind, hidden on 5+ acres in stands of mature aspen on a butte between Jackson and Wilson, might be the best estate in Jackson Hole for you. In a low-density, gated community, Summer Wind feels like a universe away from the hustle and bustle of downtown Jackson. 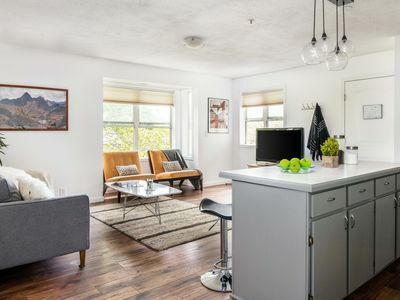 In reality, downtown’s shops, restaurants, and attractions are only a 10-minute drive away (assuming you can tear yourself away from the home’s comforts). 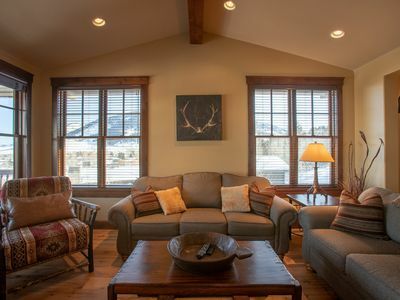 Summer Wind’s cozy-yet-sophisticated mountain modern design, amazing Teton views, expansive outdoor terrace, home theater, outdoor hot tub, and sauna are extra credit. 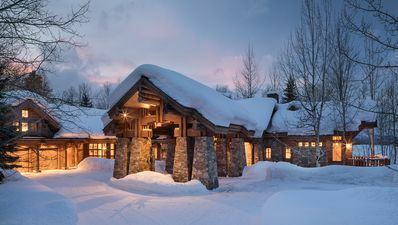 The feel of your Summer Wind stay starts as soon as you turn onto its private driveway, which winds through high snow banks (winter) or wildflowers and aspens (summer) before depositing you at its grand fieldstone, log, and timber porte-cochère. 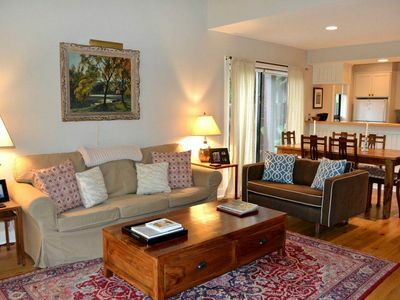 Entering the home, you’re immediately struck by the balance of warmth and grandeur. 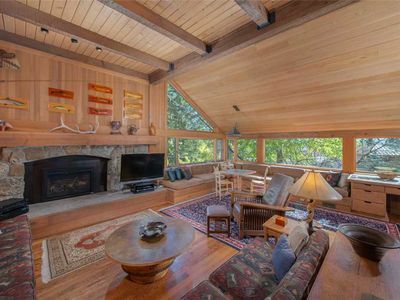 Summer Wind is almost 9,000-square-feet, and the ceilings (and windows) in the great room are almost thirty feet high, but smart and thoughtful design keeps the home from ever feeling cavernous. 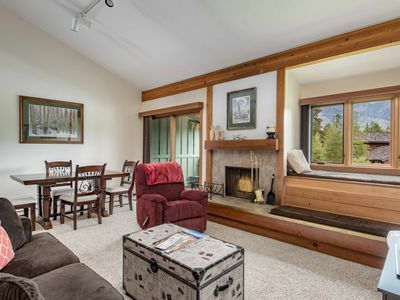 Newly remodeled, Summer Wind has six bedrooms and can sleep up to 16 guests. Two bedrooms are in an apartment above the garage that feels separate from the rest of the house. Another bedroom is a 4-bed bunk room suite (two beds are twin; two others are full). The three remaining bedrooms are suites. 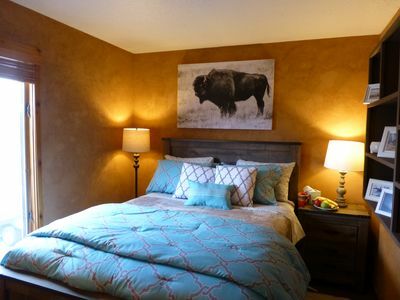 Summer Wind’s master suite, which fills the entirety of main floor’s north wing, is stunning. 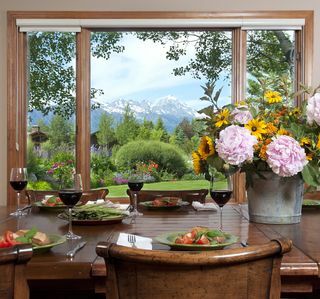 Soak up views of the Tetons from the king-size bed, while relaxing in a deep soaking tub, or while sitting in front of a wood-burning fireplace. 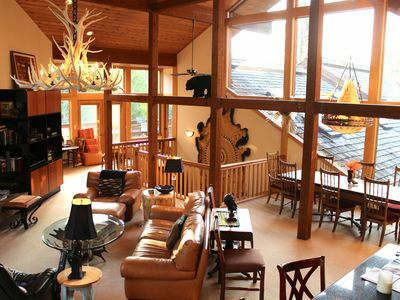 Or maybe you’ll see an elk or moose walking past right outside the windows! Several small elk herds live in this area. 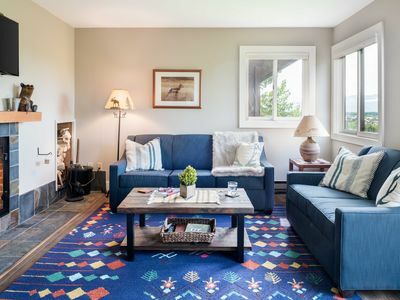 Summer Wind’s ground floor was planned for low-key gatherings and fun. 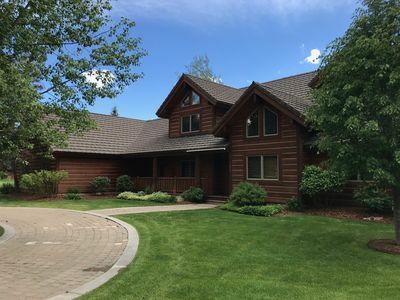 This is where the home theater is located, as well as a separate TV room, a billiard table, a wine cellar and well-appointed bar area, and a home gym. Many of the rooms on this floor have direct access to outdoor terraces. The northern wing of the ground floor has the bunk room. Adjacent to the bunk room is a kid-friendly bedroom suite with a Queen bed and room for a crib if needed. 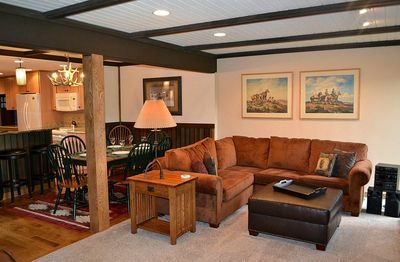 Back on the main floor, the great room, which is open to the dining area, is Summer Wind’s heart. Off it is an intimate office from which a spiral staircase climbs up to a loft that might be the coziest spot in the home. 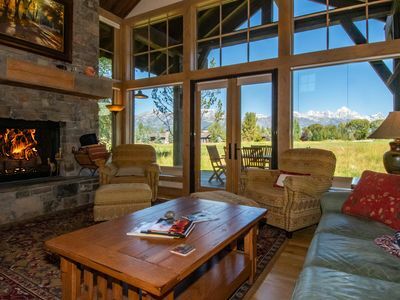 This hidden loft overlooks the great room and enjoys the same dramatic views of the Tetons as that space. 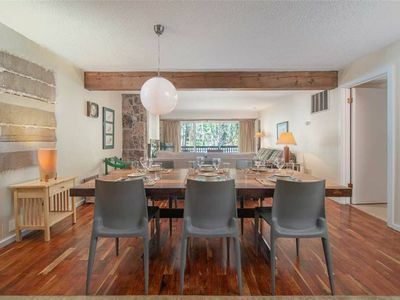 Connected to the dining room (but separate), is a professional-grade kitchen with marble counter tops, side-by-side Sub-Zero refrigerators, a walk-in pantry, a six-burner Thermador range, an elk antler chandelier, a breakfast nook, and high ceilings featuring impressive logs and timbers. 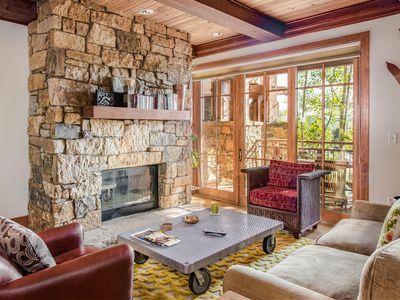 A stone patio on Summer Wind’s northwest side has been recently redone and expanded so that there is now almost as much outdoor living space as there is space in the great room and dining room. 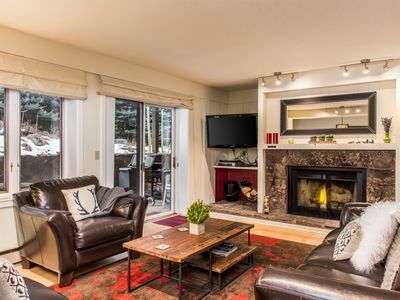 Outside is a hot tub, a kitchen, and lounge area. Part of this terrace, including the hot tub and kitchen, is covered so that it can be enjoyed year-round. Summer Wind is in the Indian Springs neighborhood off Wyoming Highway 22 between the Town of Jackson and the community of Wilson. Both Jackson and Wilson are 10-minute drives. 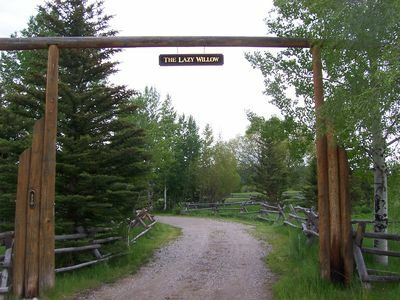 Teton Village and the Jackson Hole Mountain Resort are about 20 minutes away by car. A pathway for pedestrians and cyclists connects Indian Springs to all of these locations too.
" 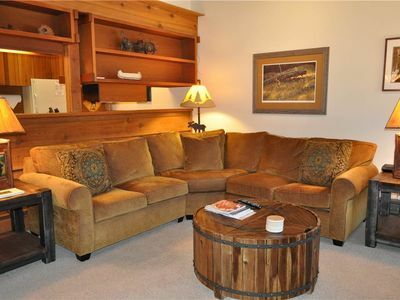 The Lazy Willow" ..
Cinquefoil 1615: 2Br+Loft - The Aspens -Townhome with Lovely Interior and Tons of Outdoor Space! 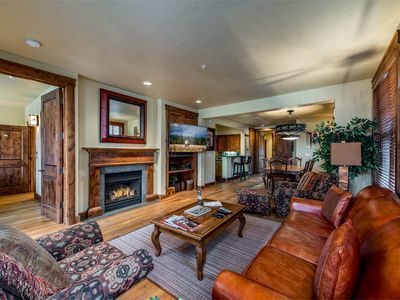 RMR: Cozy 2 BR plus Loft Condo in the Aspens! Great views + Free Activities! Outpost: Teewinot C1 - Hot Tub & Pool Access!